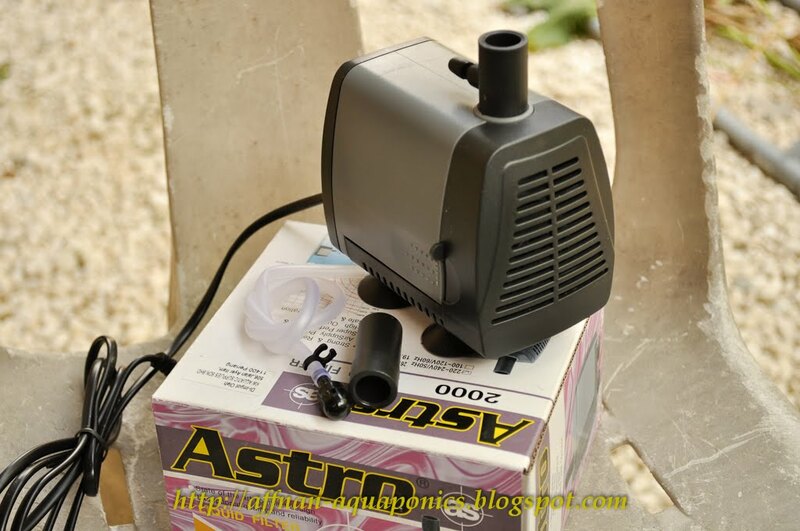 Water pump is an important item in any Aquaponics setup. It is a simple device that draw in water from surrounding and send out to location that need it. Basic understanding of pump function and safety precaution is important to ensure trouble free operation and no mishap. Voltage requirement either it is Direct Current (DC) or Alternating Current (AC) at a rating of 110 Volts or 220 Volts. 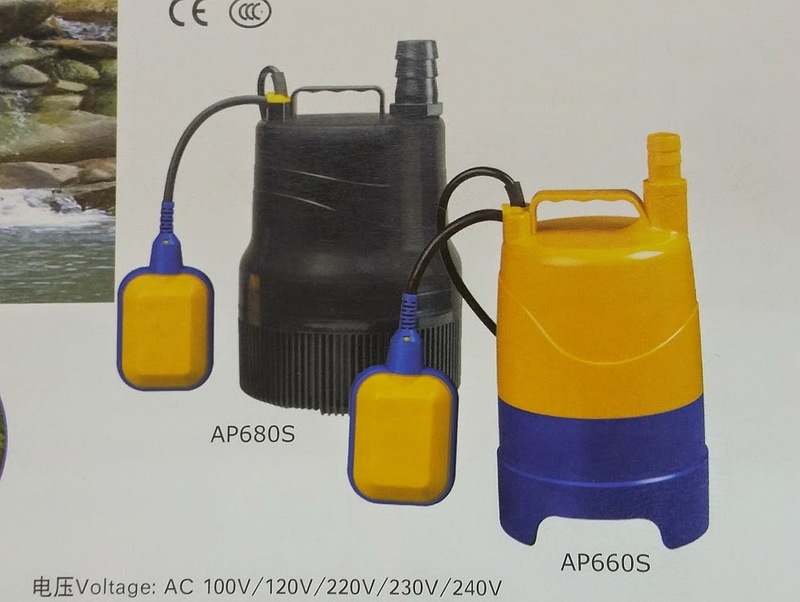 DC voltage is much lower, but this write up will only deal on AC pumps. Voltage rating is local to your area, normally it will follow all electrical equipment in that area. Power rating in Watt this is the energy use by the pump while operating and this will determine how much you will be paying for the electricity bill. Maximum water delivery flow, this is the liter/hr rating and usually at 0 height. Maximum Height, this the height that the pump can deliver if you are to transport the water vertically. 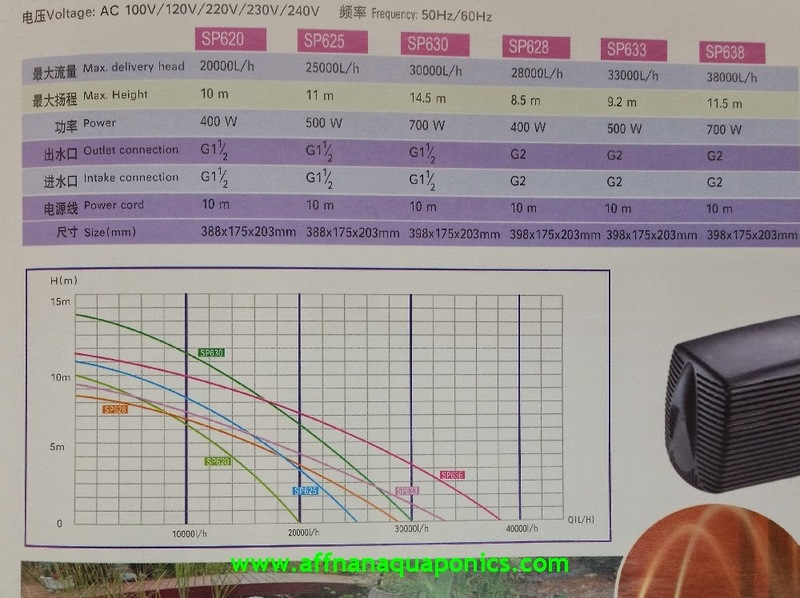 Most of the time we will use submersible pump for Aquaponics, the pump may has a float switch to cut off once water reaches it lowest safe operating level or just a straight forward pump without any switch to control. 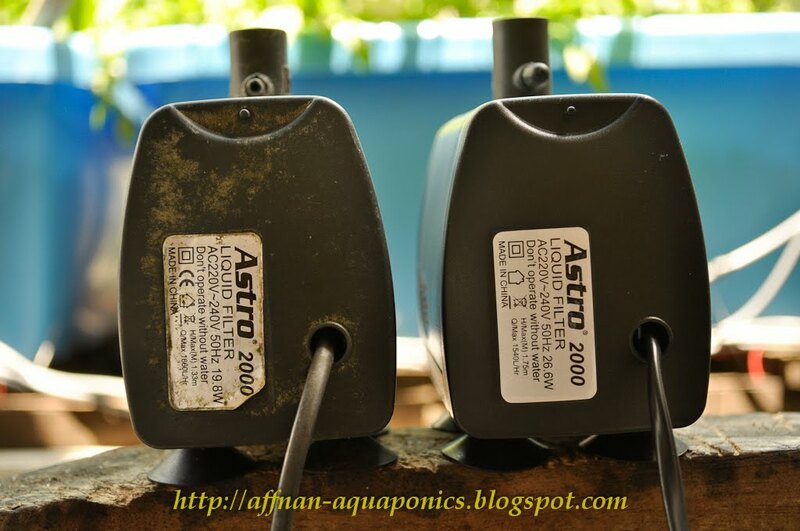 It is safer to use a pump with a float switch since it has safety back up. Above is a float switch pump and below without. Higher quality pump has a thermal cutout that will cut off pump operation if temperature rises above a predetermine value. This is a good feature because pump can be damage if its cooling fail or overheated. If you experience pump cutting off and then restart intermittently this could be one such case where the thermal switch cut off power to pump internally. One important factor for choosing a pump is how much water is needed. Lets say each growbed has a siphon and each siphon requires an average of 800 liters per hour to function correctly. What is the pump rating that needed for this system ? 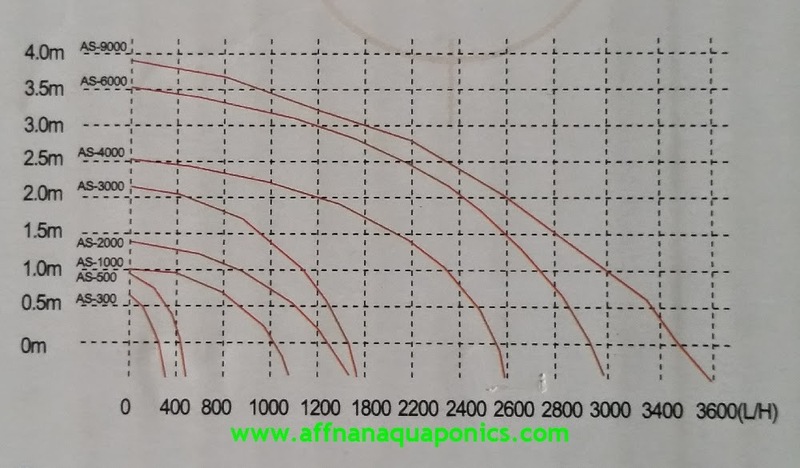 If you need actual 800 liter per hour water inflow into the growbed and if it locate at a higher point say half a meter from the fish tank water level, you will need to take into account this factor to chose the correct pump. Chart above show roughly various pump capacity with reference to delivery height, as the height increase its delivery drop to virtually zero and as the height reduce to zero flow will be at its maximum. Therefor as an example if the capacity needed is 800lt/hr at 0.5 meter base on the above chart you will need at least a 1000 liter per hour rated pump. On multiple growbed installation, the pump capacity is the total flow required by all growbeds. Above is another example showing pump delivery with respect to height where it also showing pump power consumption above it. Not all pump are created equal some are more efficient that others. In general there are two type of material for making a pump rotor which is the center rotating part. A Magnet rotor will made it into a Permanent Magnet Motor pump and an alloy rotor will make it an Induction Motor pump. Above illustration is an Induction motor pump, which has an alloy rotor. It will become an electromagnet once induced by current flowing in the stationery part within the pump motor housing. Above is a magnet rotor from a small pump, this pump behave like a synchronous motor since it rotational speed will follow the AC frequency. Power rating of this pump dependent on strength of this magnet, as magnet deteriorates it will reduce pump delivery capacity. However it does takes a long long time for this deterioration to happen, more likely a mechanical failure or wear and tear will occur before the magnet looses its strength. Induction Motor pump is stronger and more efficient, they are more expensive too. These pump are made in the higher capacity range, on averages it start from 4500 liter per hour rating and above. This pump has a better cooling and overall mechanical build. 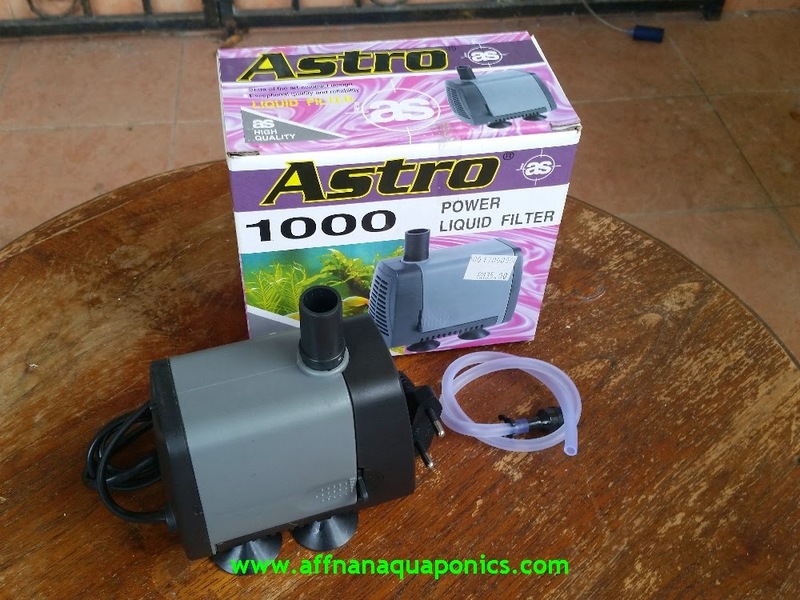 If you are setting an Aquaponics set with 4 growbed or more it is advisable to invest in one of this pump. Above example is an Induction Motor pump which is energy efficient and very quiet in its operation. 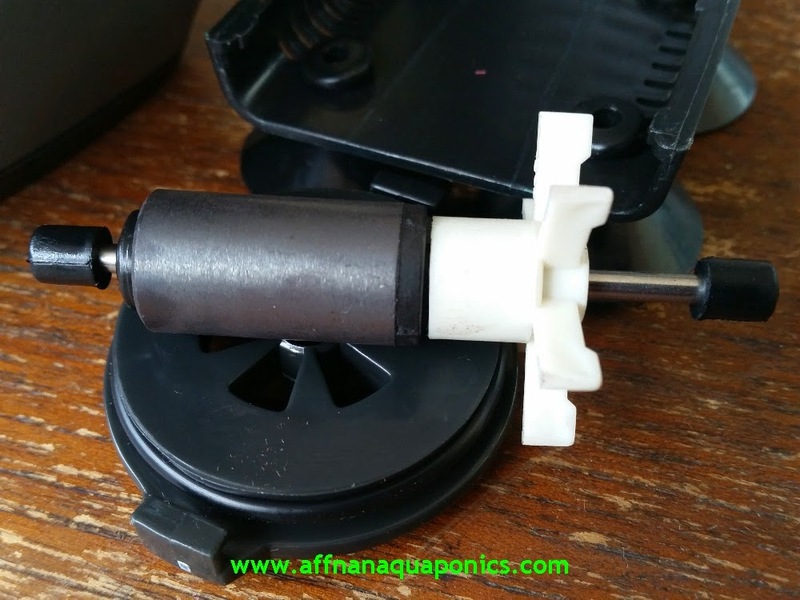 Example of a cheap Magnet Motor pump for low flow operation. These pump is okay to use if you are not having multiple growbed. Another sample from same manufacturer but at higher capacity. Typical pump rating that gives the wattage, flow rate and maximum height that this pump can deliver. The rating of 1540 or 1660 liters per hour is at zero height and more likely at max height, the flow will reduce to a trickle zero. Electrical power and water don't mix, this is a dangerous situation. Submersible pumps must comply with a very high standard of insulation and water proof specification of IPX-8. 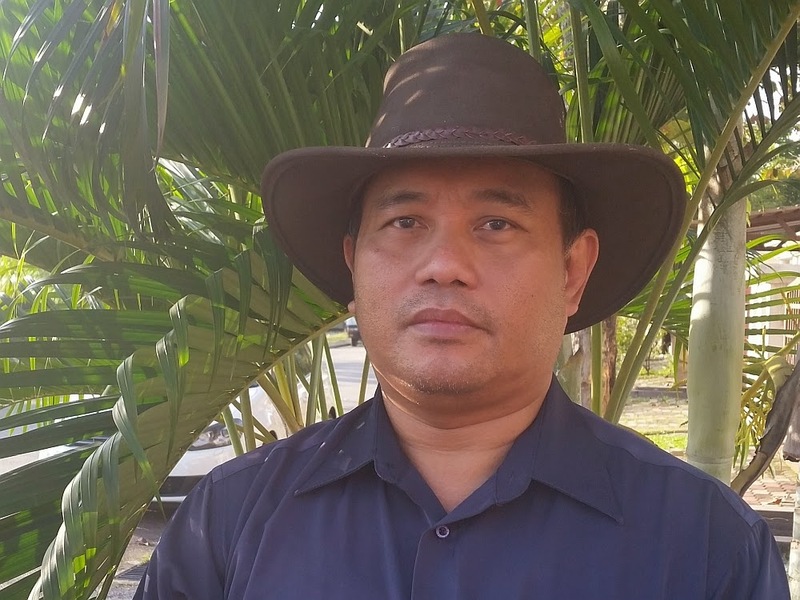 Routine inspection of electrical wires, pump casing and its internal rotor is important. 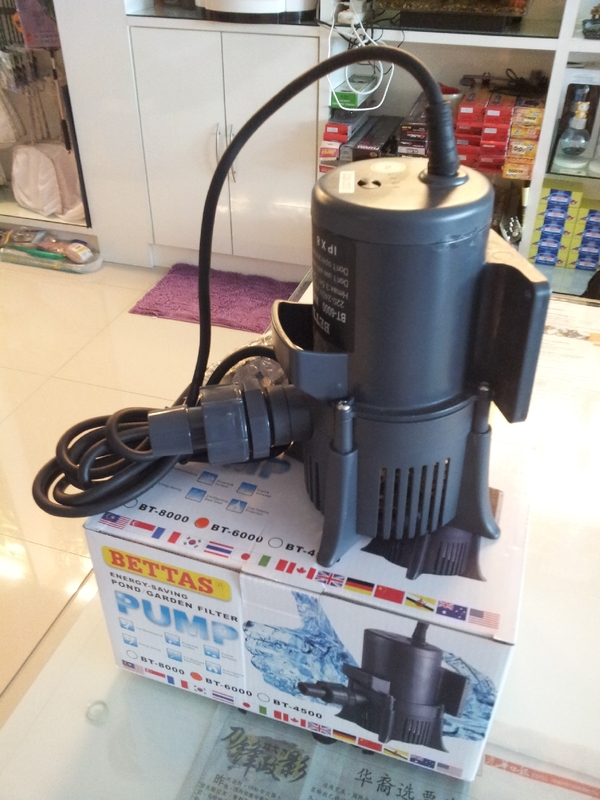 When working within the aquarium or fish tank it is mandatory to switch off the pump and isolate it from the mains. This is to prevent accidental electrocution while we have our hand and feet in the water. 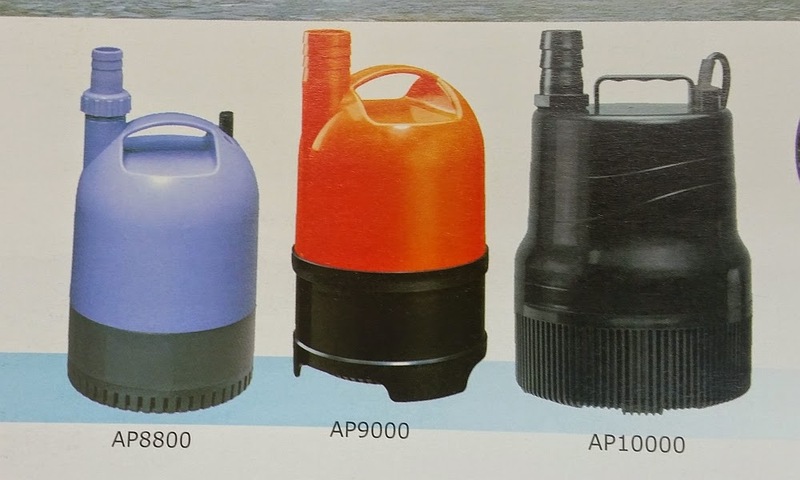 There are many type of water pump, to cover all in a simple write up is not possible, this short blog post is the tip of what kind of pump available out there and the objective of this short posting is for reader have some idea of what the important thing to look for in a pump.